This month’s featured work is “Vennel” which I painted in March 2017. The scene is of a street, or more specifically, “Vennel” in the heart of Edinburgh near the Grassmarket. 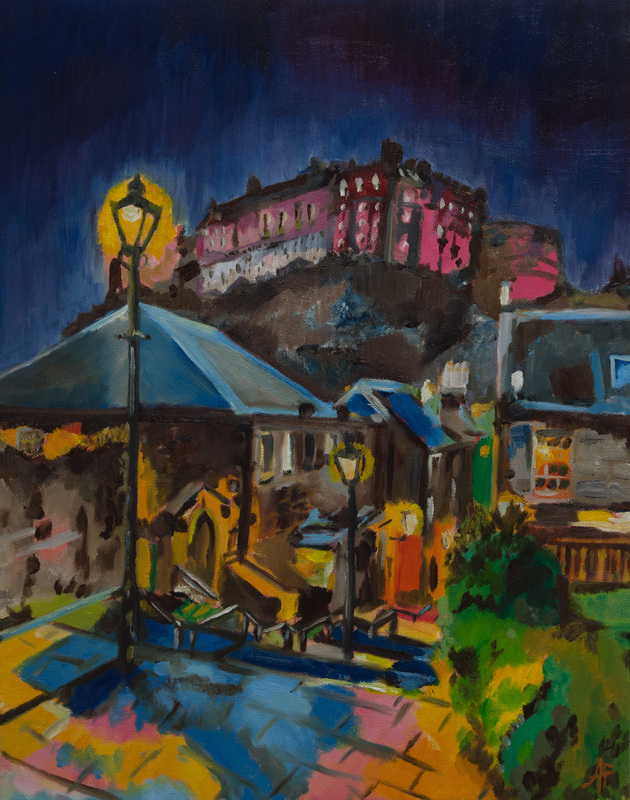 It’s a narrow alleyway with steps leading down to the Grassmarket itself with a beautiful view of Edinburgh Castle. The painting draws inspiration from the Fauvist movement and the artist Henri Matisse. This painting was a challenge for a number of reasons, mainly due to the limited time I had to paint it and perspective. I drew inspiration from several source photos before settling on a composition I liked. I translated that onto canvas with a baseline drawing and then put a gentle acrylic yellow ochre wash over the sketch. In order not to lose the perspective I reinforced the drawing again with red acrylic. This acted as my template in which to then fill the rest with colour. I was trying a slightly different technique with this piece of work compared with others where I systematically built up the painting based on the tones of colour rather than building it up section by section. I started off with the dark browns and blues working my way up to the brighter lights. Along this “journey” I experimented with bold colours to compliment the darkness of the buildings. Colours are fairly clearly demarcated with minimal tonal gradient between the lights and darks. This was partly by accident and partly on purpose. As the painting built up I really liked how the clearly defined areas of colour occupied the canvas inspired by the fauvist movement and artists like Matisse. I had intended to create something more impressionistic but as the painting progressed, I felt the lines of the composition created enough of a coherent structure for the colours to sit nicely and because the composition had so many clear horizontal and vertical lines I didn’t want these to be lost. The sky became a bit of an issue which I ended up painting last because I wasn’t sure what to do. Having already painted the castle in this sort of heady, unrealistic, and dare I say garish pinks and purples, I experimented with different skies including a vibrant starry sky, a stormy sky but these did not sit well with the entire painting as a whole. The simple dark Prussian blue at the very top allowed the castle to really stand out. I purposely made the paint around the outline of the castle a slightly lighter tone to enhance this and make this look more twilight than night. 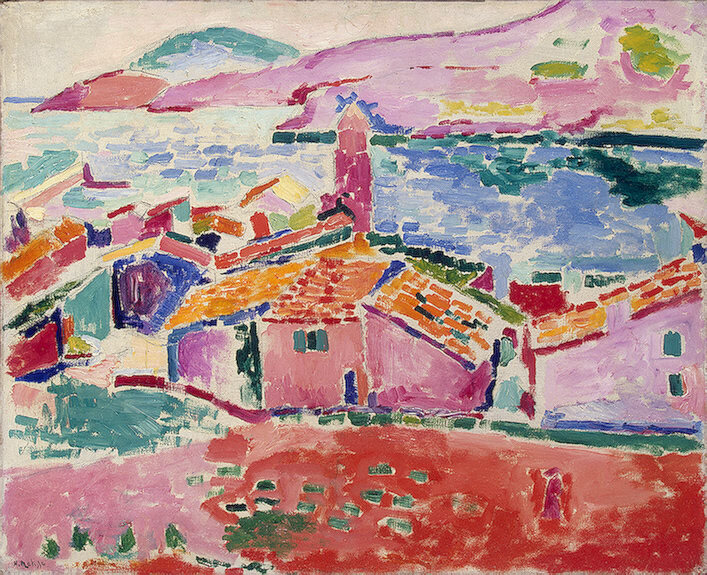 There is an element of exaggerated colour usage which was very much taken directly from fauvism. I thoroughly enjoyed the perspective challenges in this and certainly this is probably my most “planned” painting whereby the baseline drawing absolutely and fundamentally made the whole process of painting this easier and quicker. 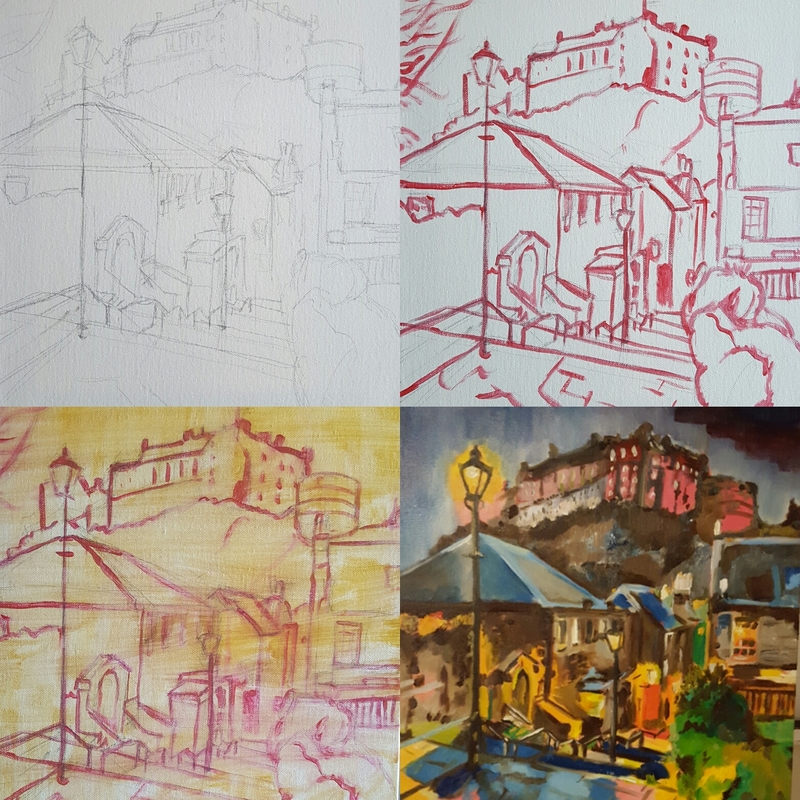 Getting the perspective right earlier in the drawing freed me up to experiment with colour later on and focusing on one individual colour at a time, first the browns, then the blues then the oranges didn’t allow me to obsess too closely on one aspect of the painting but rather gave me a much better global view. Consequentially what’s possibly missing are the more sudden or impromptu brushstrokes like other paintings that are usually based on no real reason except my own personal emotional state, instinct and a “let’s-see-what-happens” view. This painting also reinforced my love of night scenes. With this painting I was much more disciplined and I was pleased with the final result. For anyone who wants to see this view in real life the street is called “Vennel” off the Grassmarket and once you reach the top of the steps you’ll see the castle in all it’s glory. Be warned however, it sadly won’t be pink! Keep up-to-date on my artwork and new paintings with Bones and Brushes!